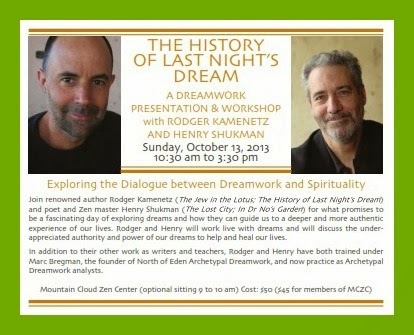 Rodger and Henry: With great pleasure, Abq Jew announces that dreamworkers and poets Rodger Kamenetz and Henry Shukman will be presenting both a Dream Workshop and a Poetry Reading in Santa Fe this month. Rodger and Henry will work live with dreams and will discuss the underappreciated authority and power of our dreams to help and heal our lives. In addition to their other work as writers and teachers, Rodger and Henry have both trained under Marc Bregman, the founder of North of Eden Archetypal Dreamwork, and now practice as Archetypal Dreamwork analysts. 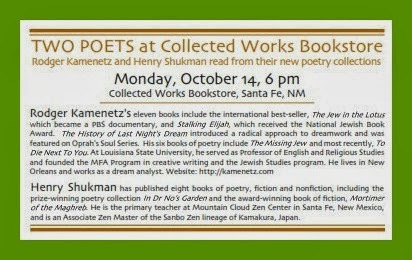 Rodger Kamenetz and Henry Shukman will read from their new poetry collections. In 1990, Tibet's Buddhist leader, the Dalai Lama, invited eight Jewish delegates to Dharamsala, India, to ask them, "What is the secret of Jewish spiritual survival in exile?" Rodger Kamenetz is the author of The Jew In The Lotus, the acclaimed account of that meeting - as well as several other works of poetry and prose. 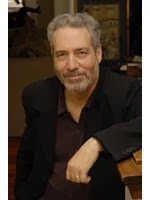 Abq Jew is happy to report that Kamenetz, recently retired from his position as LSU Distinguished Professor and Sternberg Honors Chair Professor, has recently written yet another thoughtful, provocative, intelligent book. That book was, of course, Burnt Books, about two of the most celebrated mystical masters and storytellers of our time: Rabbi Nachman of Bratslav (1772-1810) and Franz Kafka (1883-1924). International bestselling author Rodger Kamenetz believes it is not too late to reclaim the lost power of our nightly visions. He fearlessly delves into this mysterious inner realm and shows us that dreams are not only intensely meaningful, but hold essential truths about who we are. In the end, each of us has the choice to embark on this illuminating path to the soul. 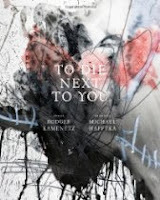 Rodger's most recent book of poetry is To Die Next To You. 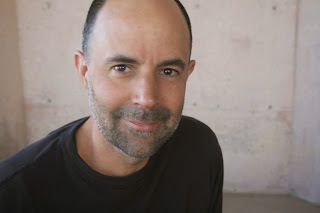 Henry Shukman is a Zen teacher in the Sanbo Kyodan lineage, a Zen school dedicated to lay practice and to making the authentic Dharma of Zen available to Westerners. He has trained primarily with Joan Rieck Roshi and with Zen teacher John Gaynor, and now continues his own training under Yamada Ryoun Roshi, current abbot of the Sanbo Kyodan. Henry is dedicated to what he sees as core Zen training – clarifying our essential nature to our own satisfaction, and thereby finding true peace of mind. Henry has published eight books of poetry, fiction and nonfiction, including the prize-winning poetry collection In Dr No’s Garden and the award-winning book of fiction, Mortimer of the Maghreb.